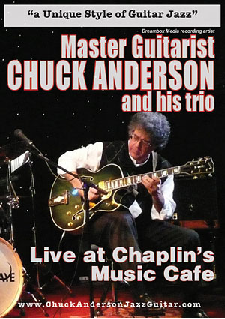 With over an hour of straight ahead, guitar trio jazz featuring Chuck Anderson, a virtuoso player who is sheer pleasure to hear. The disc aims to recreate a live performance by showcasing Anderson’s group in a nightclub setting, with high definition sound and clear, simply structured video imaging that gives a sense of “being there,” without distracting from the music itself … Anderson is a consummate musician and mentor from whom almost any guitarist could learn a great deal. Eric Schreiber on 5-string bass and Ed Rick on drums and percussion provide perfect foils. At times the group functions almost as one instrument: its playing is that well-coordinated. Read the full review on the allaboutjazz.com website.